DC Comics' 'Suicide Squad Most Wanted: El Diablo and Boomerang' #1 (of 6) is really two separate stories that will eventually cross over but it sets the groundwork for two of the "worst heroes ever." The creative teams of Jai Nitz and Cliff Richards (El Diablo) and Michael Moreci and Oscar Bazaldua (Boomerang) give each character a distinctive storyline worth checking out. It's a tricky job for Nitz as he has to balance Chato Santana as the reluctant footsoldier for Waller's Task Force X and the former drug runner seeking redemption. The portrayal of a Latino gang-banger is as stereotypical as Italian, Irish, or Russian mobsters, but it seems the directive from DC, in the film too, is to humanize El Diablo and soften his image. Nitz goes as far as making him a benevolent neighborhood drug pusher with a spiritual side. The result is mixed but overall an intriguing profile with a lot of potential for Chato whose left without many options and a chance to thumb his nose at Waller in the process. The art is dynamic and energetic as Richards' fight scenes hum with devastating action. The character designs are varied but most notably Bloodletter is unique and intimidating. The perfect foil, beastly and devilish, for a man like Chato looking for divine forgiveness. Hi-Fi's color work is fantastic as usual, adding bold deep colors, enriching each scene from a prison beat down to a house engulfed in flames. 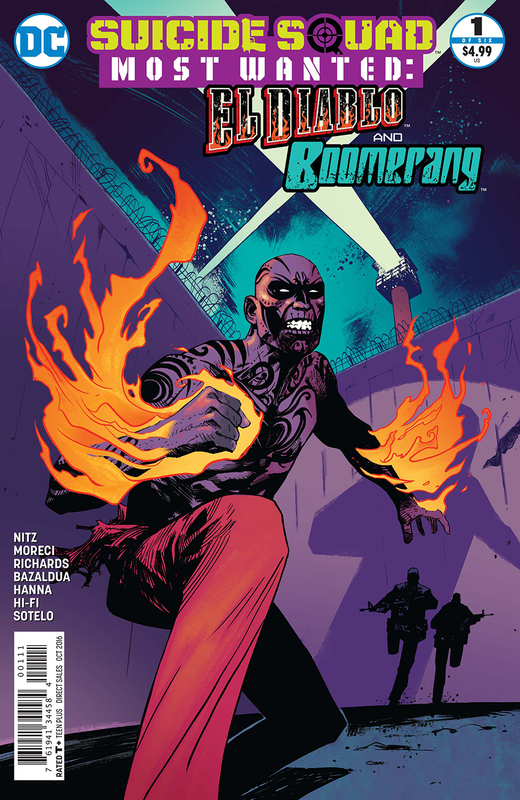 Boomerang has his own set of problems as things go awry while on a mission with Task Force X. Amid the battle, Digger Harkness, decides to take a long pub break before helping out his mates. That doesn't sit too well with Deadshot but it's all for naught because they accidently left him behind. Now it's up to Boomerang and a mysterious girl to make it out alive of a South American country while being chased by El Jaguar's minions. Moreci's talent for dialogue is on full display with a chatty character like Digger. His snarkiness and "semi-racist attitude" makes for some entertaining predicaments. It's a fast-paced story that doesn't quite feel significant enough at first but then it becomes clear that the stakes couldn't be much higher. It's a quick exciting introduction into Boomerang's storyline with, again, like the El Diablo story a lot of potential. As for the art, there's no downgrade from the El Diablo portion either. Bazaldua keeps the layouts lively with virtually constant characters in motion. They're either shooting, jumping, kicking, throwing boomerangs, or running throughout the story. Bazaldua delivers clean crisp lines and has great command of facial expressions starting with Digger. The only "downside" if you will is Harley Quinn. As drawn by Bazaldua she looks fine but it takes some getting used to as I've become accustomed to the Amanda Conner/Chad Hardin version for so long. Overall, the art and colors are first-rate. In 'Suicide Squad Most Wanted: El Diablo and Boomerang' you get two stories for the price of one. Considering that both have a lot going for them and make you want to read more I'd say it's not only a bargain but well worth your time.